The Monsanto Tribunal is an international civil society initiative to hold Monsanto accountable for human rights violations, for crimes against humanity, and for ecocide. Eminent judges heard testimonies from victims, and delivered a legal opinion following procedures of the International Court of Justice. A distinct and parallel event, the People's Assembly, was a gathering of social movements from all over the world that exchanged ideas and planned for the future we want. The Tribunal and People's Assembly took place between 14 and 16 October 2016 in The Hague, Netherlands. On Tuesday April 18th 2017, the judges publicly presented their conclusions in The Hague. Monsanto’s activities undermine basic human rights, victims of multinational corporations need better protective regulations and international courts should recognize ecocide as a crime. 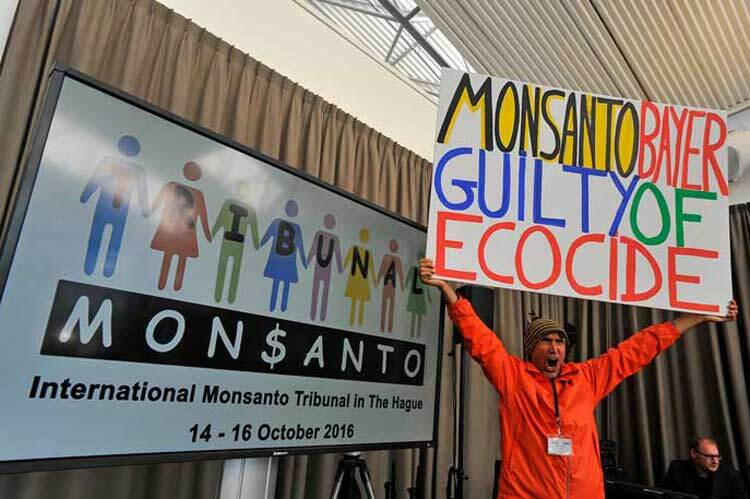 The Monsanto Tribunal of international judges presented in The Hague their legal opinion after 6 months of analysing the testimonies of more than 30 witnesses, lawyers and experts. Their conclusions are that Monsanto’s practices undermine basic human rights and the right to a healthy environment, the right to food, the right to health, it calls for better protective regulations for victims of multinational corporations and concludes that International law should clearly assert the protection of the environment and ‘ecocide’ as a crime. The Tribunal focused on the widening gap between international human rights law and corporate accountability noting that the legal provisions in place which protect investors’ rights tend to undermine the capacity of nations to maintain policies, laws and practices protecting human and environmental rights. The Judges underscore the need to assert the primacy of international human and environmental rights law in the international legal framework and concluded that urgent action needs to be taken by the UN to avoid that key questions be resolved by private tribunals operating entirely outside the international framework. Furthermore, the Tribunal reiterates that multinational enterprises should be held accountable for their actions and be subjected to the International Criminal Court jurisdiction in cases of infringement of fundamental rights. It also found that Monsanto’s conduct has seriously undermined the right to freedom indispensable for scientific research. This groundbreaking advisory opinion reinforces what movements, farmers, citizens all over the world have been contending for decades. The industrial model of agriculture, based on monocultures, extensive use of chemicals and genetically modified seeds, together with the economic model of free trade neoliberal policies and deregulation of commerce, is damaging our health and destroying our ecosystems, our soils, water and biodiversity and is a major contributor to climate change. It is poisoning the Earth and millions of people, pushing small farmers off the land, allowing corporations to establish monopolies and take control of our seed and food – while producing only a small fraction of the planet’s food. The future of our food lies in the hands of small farmers, producers of the majority of the planet’s food, poison-free, biodiverse and nourishing food. It is this ecological model of agriculture which offers the solution to poverty, hunger and malnutrition in the world and to the crisis of climate change. The Tribunal’s findings are a decisive blow to corporate power and underscores the importance of the work of thousands of activists, farmers, consumers and citizens around the world in the fight for a future of food free from toxics, GMOs, patents and corporate control. The Monsanto Tribunal is not only critical of the corporation’s activities throughout the world but points to further dangers of wider corporate control and monopoly ahead through mergers, acquisitions and agreements between giant corporations such as Monsanto-Bayer, Dow-Dupont, and Syngenta ChemChina which will result in a cartel of 3 giant seed/agro/chemical companies controlling our food and agriculture with further major negative impact on the rights of farmers and consumers, robbing them of their rights to seed and food sovereignty, with increased destruction of our biodiversity, pluralism and democracy, the systems that protect our food, health and livelihoods. The Monsanto Tribunal confirmed how poisonous products and toxic chemicals such as Round Up (Glyphosate) & Basta (Glufosinate), neonicotinoids, atrazine, and other pesticides have led to the destruction of soils, to desertification, to the extermination of bees, to the rise in health epidemics such as cancer, birth defects, and respiratory disease, to name just a few. They are contaminating people by polluting areas and poisoning our food systems. The recent UN’s Report of the Special Rapporteur on the right to food, Hilal Elver, provides a clear account on the negative effects of global pesticide use in agriculture and its impact on human rights. Last September, the International Criminal Court declared it would prioritise crimes that result in the “destruction of the environment”, “exploitation of natural resources” and the “illegal dispossession” of land and that it would now take many crimes that have been traditionally under-prosecuted into consideration. The ICC , though not formally extending its jurisdiction, will assess existing offences, such as crimes against humanity, in a broader context. The advisory opinion of the Monsanto Tribunal is a moral resolution and confirms the need to assert the primacy of international human and environmental rights law in the international legal framework. International law should now precisely and clearly assert the protection of the environment and the crime of ecocide. The Tribunal concludes that if such a crime of Ecocide were recognized in international criminal law, the activities of Monsanto could possibly constitute a crime of ecocide. Civil society movements now have a new instrument and an eminent legal advisory opinion to enforce their actions to defend the rights of the Earth and of people.